Are your tires bald? Is your car pulling to the right? Have you gone 3,000 miles since your last oil change? 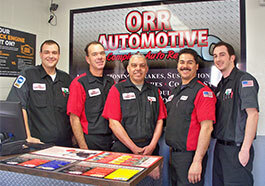 Orr Automotive in Montclair, CA offers all the auto services and tires you need, right here under one roof. We are a certified tire dealer of the most trusted brands, and we stock tires for cars, trucks, SUVs, vans, and more. Don't know what size tire your vehicle needs? Let us help—call (909) 625-8936. In need of vehicle repair or maintenance? We offer oil changes, alignments, computerized engine diagnostics, and other valuable automotive services at affordable prices. For the complete list of repairs we offer, view our Services page. We have been serving customers from the Inland Empire for years. Stop in and see why Orr Automotive is the area's leading auto service provider.